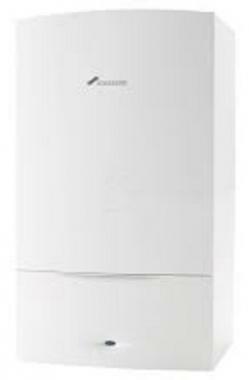 The Worcester-Bosch Greenstar 24i System is one of a range of highly energy efficient A rated by SEDBUK 2009(Seasonal Efficiency of Domestic Boilers in the United Kingdom) gas-fired condensing boilers available from Worcester-Bosch. Being a system boiler the Worcester-Bosch Greenstar 24i System requires a hot water storage cylinder but no feed and expansion cistern making it quick and easy to install as well as being efficient and economical to run. In fact the Worcester-Bosch Greenstar 24i System recycles the heat from exhaust gases that would otherwise be lost through the flue and modulates its output independently for domestic hot water and central heating making it up to 30% cheaper to run than some older boilers. The storage capacity of your hot water cylinder is the determining factor in the amount of hot water readily available to your household but the Worcester-Bosch Greenstar 24i System with a maximum output of 24kW (kilowatts) or 82000Btu (British thermal units) per hour is typically suitable for a medium or large family house with a traditional heating system. They need to simplify the boiler with more thought towards the fitter and the installation process. Access to screws and internal fittings was difficult especially when removing the condense trap. I installed one recently and hoped that they might of addressed those issues, but hey presto, they haven't! I have recently had this boiler installed alongside a Joule unvented cylinder controlled by a Nest thermostat. It's a quiet efficient boiler that's providing more than enough hot water and heating for a family of 5 in a 5 bed detached house. Our previous Potterton boiler struggled to heat the house so good choice to change to the 24i.